You know the whole "Elf on a Shelf" thing that's been popular at Christmas time the last couple of years? I thought the idea was so cute, but I never wanted to do it at Christmas. There's already so much going on and I try really hard to teach my kids what Christmas is really about. So, I started thinking. St. Patrick's Day is kind of a weird holiday to me....and it could probably use a little something. So instead of an Elf on a Shelf we're starting a new tradition around here. I'm calling it our "Leprechaun on a Ledge." I'm serious. Besides, aren't leprechauns supposed to be mischievous? Perfect. It will do the same thing as the elf - get into trouble at night. And the boys will have just as much fun finding him. and seeing what he's been up to. I'm kind of excited about it. Random Sidenote: In the picture above I drew his nose and mouth on in the photo editing software. I didn't stitch it yet because I wasn't sure how I wanted it to look. He's a risk taker already. 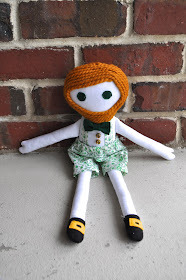 I made the doll myself, using the doll tutorial found HERE at Make It and Love It. I've never made a doll before, but it was fun. It's a great easy-to-follow tutorial. Now I might need to make one for the baby. 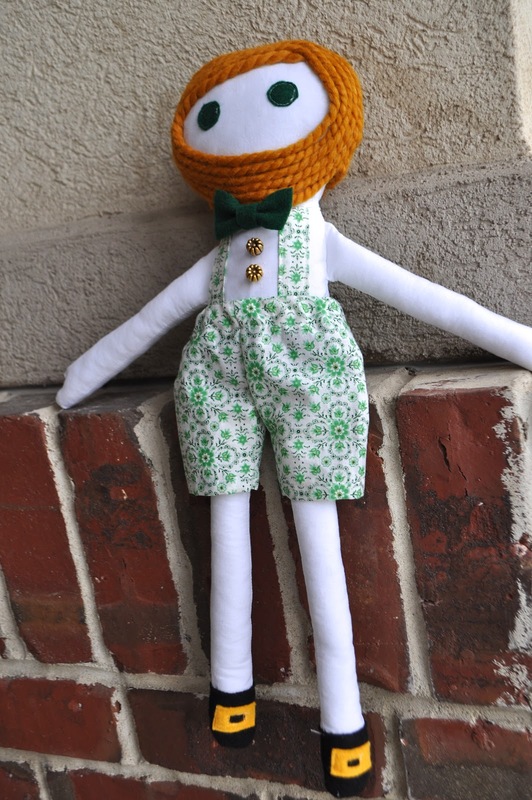 I didn't want to make him a whole suit, so I went for shorts and suspenders. The shorts are removable. For the hair I used some yarn I had lying around. I hot glued it on very carefully. Baden picked out some gold buttons for him and he needed a bow tie as well. The doll is kind of a fun size. So this little guy will start his mischief tonight. One of these nights I'll have to sew him a hat, too. And that's all for today. Thanks for stopping by. Super idea, Cheri! It will be so much nicer to do it without all the craziness of Christmas going on. I wish we had never started the Elf on the Shelf for that very reason, but doing it in March wouldn't be bad at all- I'm sure your kids will love it! I agree about not doing it at Christmas. I think he is adorable. I'm wondering what he would look like with some facial hair ;) I was about to say, you better get good at making dolls. My Easton got a personalized karate stuffed doll for Christmas. 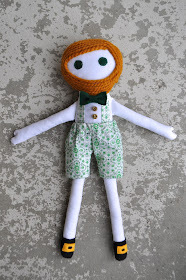 He think it is wearing pajamas :) They come off too, so I have been thinking of making some other clothes for him. I love the suspenders and shorts. I wasn't paying attention and see that he has a beard. It would be cute if he had a mustache come down to meet though. My husband has that, so I'm kinda biased. What a cute idea. You are so clever, always doing such fun stuff with your boys. I love it! I think I'll be making one of these guys tonight. Thanks for the great idea! I LOVE it! With a last name like McDermott (and my maiden name of McBride!) 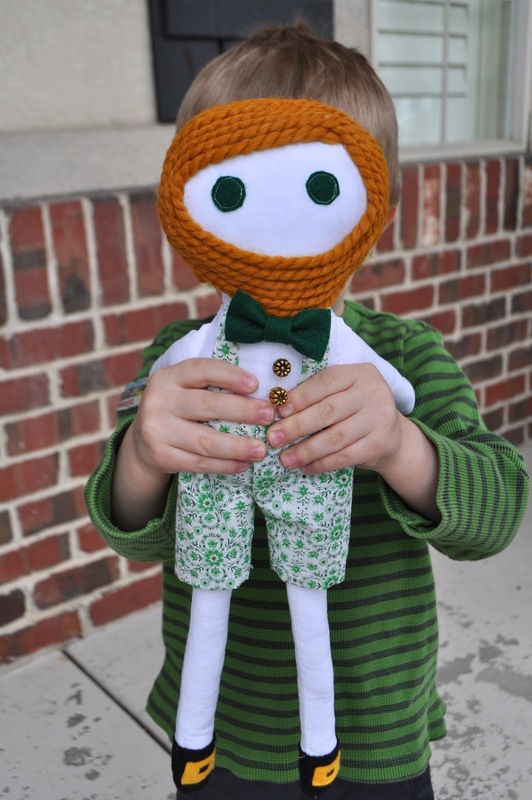 we are partial to St Patrick's Day around here. This will be awesome to add to our traditions. Thanks! Can't wait to see the mischief your leprechaun gets into! I love your idea! I always thought it would be fun to do the "Elf on a Shelf", but it would just add to an already busy time of year. I too, focus on the true meaning of Christmas. I think this would be fun to do for St. Pat's day, since there's not much going on, and these little guys do have a 'rep' for mischief! Thanks for sharing your idea. I'm gonna pin it! That's a really fun idea! I love how the doll turned out. What a brilliant idea! I like that you're doing it for St. Patrick's day too (instead of taking away from Christmas). My co-worker told me that she used to turn over tables and chairs while the students were out at recess on St. Patrick's day, so the kids would come back to see the mischief the "leprechauns" had been up to that day. Your doll is super cute! 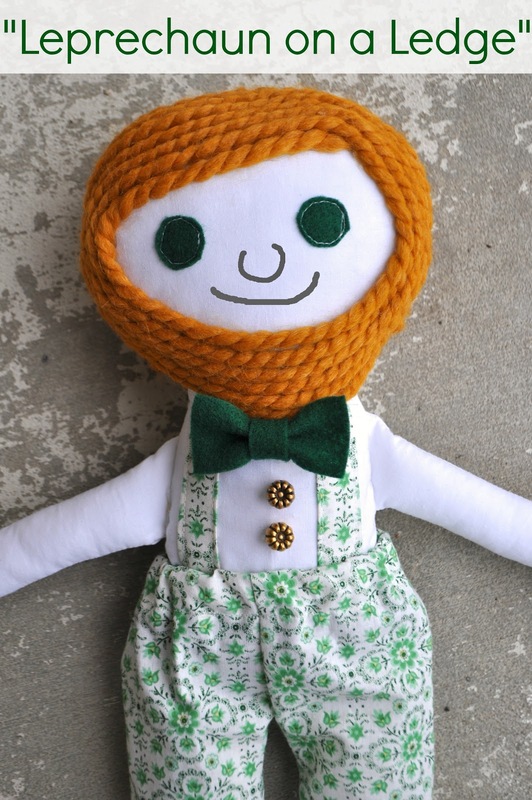 The beard/hair was a genius idea - he looks super Irish and cute! So smart!!! I feel the same way about Elf on A Shelf but its such a cute idea.... "Leprechaun on the Ledge" brilliant!!!! There's a book on Amazon.com called "The Leprechaun Trap" that sounds like it would go really well with this idea; the premise is that a naughty leprechaun comes to visit a family every March and wreaks havoc on the household each night. Kids have to make a trap to catch him... which might be right up your boys' alley. Part 2 to your new tradition! :)Thanks for the great doll idea-- your blog always inspires me! Awesome! Thanks for the tip. Sounds like that would go along perfectly with the idea. Thanks again, Blythe! Much to my surprise (and delight), my son was born with a FULL head of beautiful coppery-red hair. For some reason, having a ginger in the family makes me feel like St. Patrick's Day should be better celebrated...he looks so darling in green, after all. :) He's only a baby, but I've been thinking of how I might make the holiday fun for him as he gets older. I am SO excited about this idea and the book suggestion! you crack me up! What a fun idea lady! Hilarious and brilliant! Love the idea! What a cute idea! I've never been fond of the Elf on the Shelf (sorry to those that love it). But I think St. Patrick's Day is a perfect application for a little mischief maker. Disney movie with Sean Connery in it. It would be a great movie to show your boys and explain how leprechauns are so ornery! Love it! You have to put some green foot prints on the toilet seat and a few drops of green dye in the bowl! Such a great idea. Can't wait to start a new family tradition. That's such a cute idea! Love it! You can't stop making dolls now, the possibilities are endless. What a great idea! It really was insane trying to do the elf every night. I might have to figure out how to stop the elf and start this! Um that is brilliant! Leprechauns are supposed to be tricksters and naughty, and elves should be good examples! You are so smart. I sort of wish I saw this before we got our Elf on a Shelf. Where did you get the green material for his suspenders? I think i have a skirt made from it! Much cuter idea if you ask me! He's adorable! 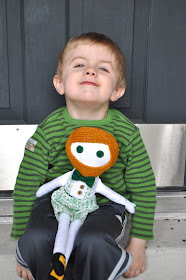 I saw the doll pinned and loved it because I keep wanting to make some dolls for my girls, but I had no idea that he was included in such a fun idea! you'd better copyright this idea before someone steals it and makes millions of dollars. seriously.